As they tour the displays, it surprises both Young Frank and Old Frank to see the unusual shapes and designs created by the Famous Franks (Frank Lloyd Wright and Frank Gehry), and others like Le Corbusier and Charlotte Perriand. 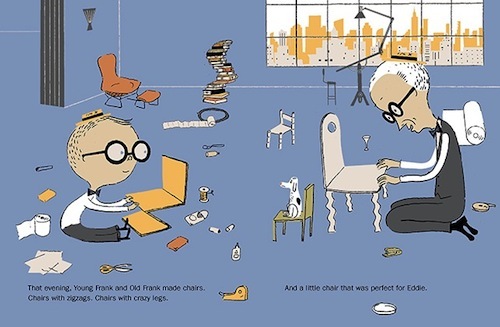 Inspired, Old Frank and Young Frank collaborate on a delightful design extravaganza in the old man’s living room, creating all sorts of inventive buildings with found objects and household items, including a library made of chocolate chip cookies, a particular favourite of Eddie, the dog. 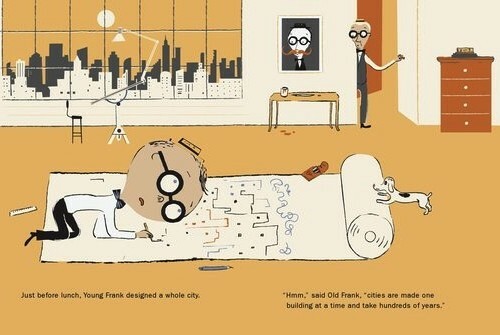 In their respective beds that night, Young Frank feels older, like a REAL architect, and his grandfather feels the flush of youth. 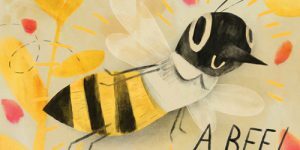 It’s a lovely, unexpected turn of events, and a sweet reminder that we are all capable of learning something, of being inspired, at any time. 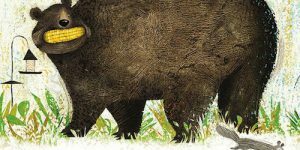 Frank Viva’s illustrations differ quite drastically from his previous books Along a Long Road, and A Long Way Away. 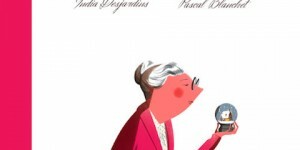 Gone are the smooth, stylized shapes and saturated colours in favour of a looser, sketchier design, but the details and characterizations retain their Vivaesque humour. 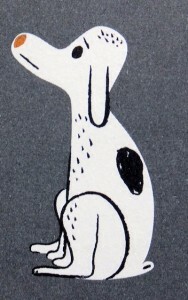 Those of you familiar with Mr Peabody’s Improbable History cartoons from Rocky & Bullwinkle may recognize Sherman in young Frank, and Eddie the dog is either Mr. Peabody or a wickedly accurate rendition of a child’s drawing of a dog. 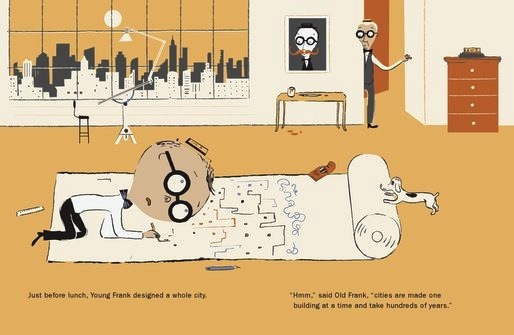 It has been suggested elsewhere that the glasses worn by both Young Frank and Old Frank were inspired by Le Corbusier, not Sherman. 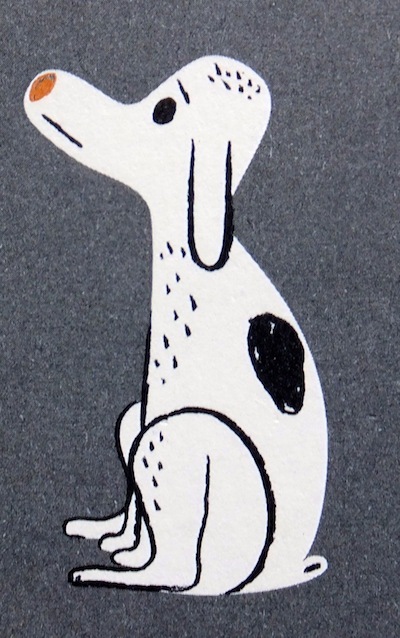 In the interest of full disclosure, my knowledge of 20th century architecture and design pales in comparison to my knowledge of 20th century cartoons, but regardless of who inspired these quirky characters, even in this small detail, I have been charmed, and gently educated. 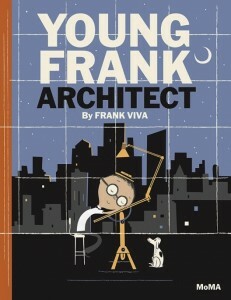 Young Frank Architect can be read on a number of levels. 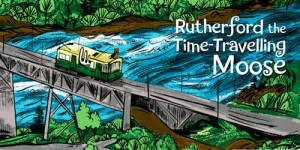 It is a journey through recent architectural history. 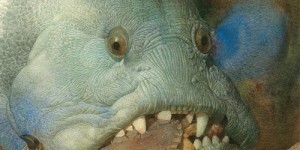 It is an unabashed celebration of urban life and all the pleasures and opportunities it affords. 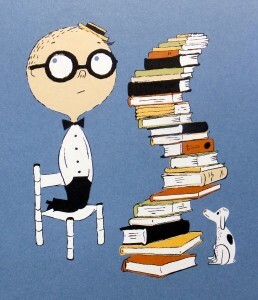 Most profoundly, however, it is the story of young and old, grandson and grandfather; the joy of shared experiences (especially those involving towers of chocolate chip cookies), and above all, a call to let our imaginations soar, no matter how young, or old, we may be. 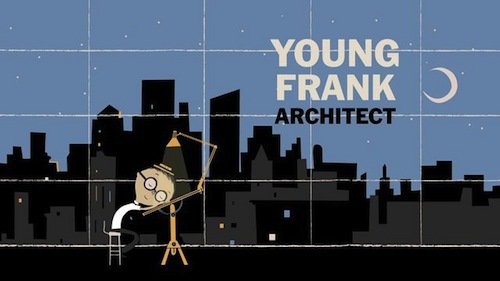 When I first read the title Young Frank Architect, I thought it was autobiographical, which did not make sense. 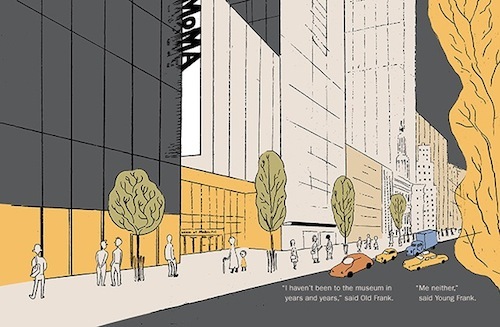 Frank Viva is not an architect; he’s an award-winning illustrator, designer, and coincidental Frank (though a Frank among Franks in every way). 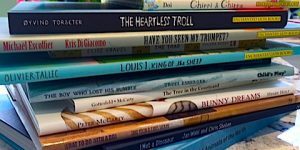 In addition to illustrating numerous New Yorker covers, he is founder of the branding and design agency Viva & Co. His first picture book, Along a Long Road, was a finalist for the Governor General’s Award (Canada) and named one of The New York Times’ ten Best Illustrated Children’s Books of 2011. Young(ish) Frank Illustrator lives in Toronto, with his family. 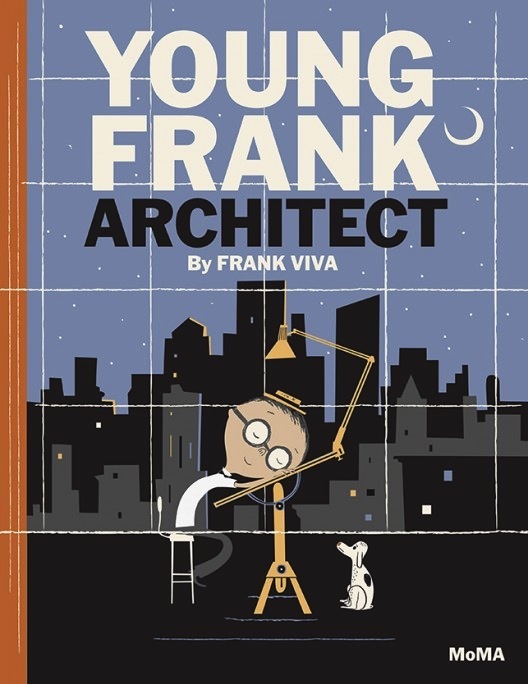 Young Frank Architect by Frank Viva, published by the Museum of Modern Art, 2013. For a further exploration of modern art and children’s picture books, have a look at Coppernickel Goes Mondrian by Router Van Reek.